Visitors to Space Mountain today, with its Buck Rogers, sci-fi-inspired trappings, might be excused for forgetting the over-the-top NASA awesomeness that was the style back when the ride opened in 1975. (Does anyone else miss this statue out front?) Hopefully I can jog some memories with my attempt at a Space Mountain poster, a ride whose previous posters have always seemed like afterthoughts. As I did with my earlier posters, I’ve provided versions that you can download yourself, print out, decorate your wall, etc. The only thing I ask is that if you like it enough to download it, please either leave a comment below or drop me a note and let me know what you think. Anyone wanting to take a deeper dive into retro Space Mountain should absolutely read show producer George McGinnis’ take on the design of the ride (part 1 and part 2). And to learn more about the actual experience of Space Mountain, check out the great Space Mountain page at Widen Your World. There are two versions of the poster: a 4 x 6 inch version with no bleed (the color “stops” right at the border of the image), and a 36 x 54 inch version with a 0.5 inch bleed (the color leaks over the edge, so if it’s trimmed you won’t see any white edges.) Since either version can be scaled by your print driver to be any size you’d like, the version you pick has less to do with the size you want the poster to be than whether you want the bleed or not. To scale the image, on the Mac, just specify the appropriate percentage in the Page Setup… dialog. On Windows I’m not sure, but there’s got to be a similar way to do it. This work is licensed under a Creative Commons Attribution-Noncommercial-Share Alike 2.5 License. And again, if you download, please leave a comment below or e-mail me! ← iPhone Apps: the First Non-HTML Web App Standard? That is brilliant! I’m going to have to find some creative way to enjoy it. Wow–great work. That is a beautiful piece of work – thanks for sharing! Excellent! Thanks much. Found the poster via popurls via boing boing. Love what you did with the 50s/70s mix, great poster! too cool! I think that I’m going to print this out for a gift. I’ll mention you. Nice retro populuxe look, sleek and optimistic, beautiful sense of movement and speed. Reminds me of the Jetson’s too. Kudos! Oh wow. You can bet your life I will download these. These are Beautiful! Thank you very much. I would love to see your version of the Jungle Cruise, Pirates of the Caribbean, People Mover, etc al la Disneyland California. This on a shirt would be awesome. In the meantime, I’ll definitely download and use it to decorate my desktop. Awesome as usual Greg! These just keep getting better and better. I agree the 70’s posters, while far more complex, usually lack all the spontaniety and boldness of the earlier posters. I think the 70’s RR posters are the only ones that really work well. Keep up the great work! Space Mountain at WDW didn’t get a attraction poster till after Disneyland’s was opened in 1977. 1972 version was the 36″x54″ large size with a silkscreen panel-banner & “Bear Country” skcreened right over the lithoed print. Wow, Mike; I thought I knew attraction posters, but compared to you I’m a complete moron. Would you mind providing links to any of the posters you’re talking about? I’m not sure if I know what you mean by the “window style” poster, and would be curious to find out. Almost all the attraction posters were scheduled to be redone. Even classc posters like “Mattern Bobsleds” “Haunted Mansion” “Alice in Wonderland” had concept done to do more elaborate serigraph posters. The Matterhorn 1978 poster production was put on the backburner as it was determined that the attraction was not at WDW and Tokyo Disneyland’s had been abandoned in final revisions so the poster costs couldn’t be justified for just Disneyland and no sponsor. So the New Matterhorn poster designed by Ken Kerr and Jim Michaelson never came to be. The response to the overly elaborate 1982 Pirates of the Caribbean poster (screened for Disneyland * WDW* and Tokyo Disneyland) was not well liked Disneyland decoratind manager said “it looked like a cereal box. We didn’t display them for very long” . So the new Haunted Mansion”window” style poster was canceled (you can see the concept sketch for that HM poster in the Haunted Mansion book by jason Surrel. The Peoplemover Thru Supper Speed Tunnel done in 1976/77 by request of Goodyear, still went over budget….the final detail outline screen was left off. This actually please the designers because they felt it was remeniscant of the 1960’s posters. I’ll try and get some images up. Not to step on Mike’s toes, but if you just google “attraction poster” and “Jungle Cruise” “Bear Jamboree” or “Mad Tea Party” you’ll see the window style he’s referring to. It’s wierd, because I never even noticed that trend until Mike pointed it out, but yes, most of the posters around that era use a window of some sort. Good lord, you learn something new every day. Mike, I didn’t know one tenth of that information in your post – this is really something that needs to be written about at length! I’d love to blog about it myself but obviously I was unaware of the entire process, and I’ve been a Disney obsessive for quite a while. I’d love to see images, though. Greg, fantastic job as always. The poster is fab. Keep up the great work! Love the poster! Thanks for your generosity in making it available. I’ve wanted, for years, to get my hands on attraction posters like the ones gracing the tunnels beneath the Walt Disney World Railroad Station as you enter the Magic Kingdom. I’ll hang this in my house with pride! well, I’ve been researching the posters for some time and have interviewd many of the designers and silkscreeners and graphic artist who work on these.I’ve been compiling a great deal of information with the intent of a book. I’ve got information on poster variations-inside jokes (like imagineers and designers appearing in the posters) and other storys on production and design changes..for all the parks. Did any of you know Wally Boag (of Tiki Room and Golden Horshoe Revue fame had a guest bathroom wallpapered in cut-up attraction posters!! Or some attraction posters were done at WED facilites at each park? for example—-The the Walt Disney World Reverse Route at WDW, or PeopleMover Thru Tron and America Sings-Del Monte (post 1974 opening) at Disneyland! Thanks for the great Tomorrowland poster! Great work! I’m speechless. It is awsome! Very nice poster! I agree this is much better than the other Space Mountain posters I’ve seen that don’t quite fit in with the other Tomorrowland attraction posters. Thank you so much! A really great poster…it’s almost too good…too profound a fusion of design elements from the period(s) – hope someone is paying you for your talents! I found you after searching for Disney vintage posters. Thanks so much for sharing your fantastic illustration. I’m going to frame it and hang it in my office. Just looking at it makes me want to hang on for dear life. Thank you very much for offering your posters up for download. I’ve always admired your work, and I really appreciate your use of classic style over the too busy and unsatisfying posters Disney has been creating. Greg, your work is awesome! I can’t wait to see what you might come up with next. You capture the feel of Disney and provide a unique look that is entirely it’s own kind of cool. Thank you so much for sharing your work with us…and for FREE! You are a true gentleman. Now, let’s see some more great work! Thanks for making this available! I’d love to see what you could do for some of the old forgotten EPCOT attractions. LOVE IT!!! Thank you, thank you, thank you for being so generous as to share this with all of us Disney World fans! I got this for my boyfriend for Christmas. Got it framed – it’s HUGE! – and he’s so excited to put it up. He’s already got Splash, Disney Railroad, Haunted Mansion and Pirates, so he’s so glad he’s got this one and not the nasty actual one that you can’t even get anymore. Truly appreciate you sharing your considerable talent! This is awesome! I think I am going to put it up at my house! This is BY FAR my favorite attration poster, authentic or otherwise. I’m so excited to add it to my collection. Very talented, thank you!!! I have been looking for a nice Space Mountain print for ages. My husband proposed to me right before space mountain so for our first anniversary it seemed like the perfect gift to get this framed! I love your Space Mountain attraction poster, its wonderfully done and fits in beautifully with all the actual posters. I just need to figure out who to use in the Los Angeles area to print it off and i’m framing this bad boy up and putting it up on my wall. Picture of which i’ll forward on as soon as I manage to get it done! Just wanted to praise your talent — you captured the Disney attraction posters awesomely. Your Tiki birthday card was spectacular as well. I work as a graphic designer as well but I am just a hack compared to guys like you. Thanks so much for providing the attraction posters, I am going to hang them up in my office as inspiration. Now if I could just get my hands on a Matterhorn bobsled poster pdf . . . I hope you got some kind of credit for this, because it’s awfully close to your wonderful poster. In fact, I had to do a double-take to make sure it wasn’t your poster at first. Interesting! Nope, hadn’t heard of the poster before now. I LOVE the space mountain and tomorrowland posters. Tomorrowland is framed next to my original haunted mansion poster. Are you going to make any other posters? An Epcot poster in the theme of these would be awesome! This is my favorite attraction, and I was always bummed with the official poster as well, considering how much I love the earlier attraction posters. Great work! Okay…first, I find out you make this art available for free to us fans, and then I see another of your passions is Pinball (like myself?) I’m in love! Seriously, thank you so much. I just happen to have a nice plotter at work perfect for attempting the 36″x54″. Gotta rustle up some higher quality paper.. I used to always look at the posters going through while my parents would rush me through the WDW train station. The best was the Haunted Mansion one!! Wow! Amazing! I had seen it before, and assumed it was the official one! After all, it does look like something Disney would put out. Plus, the new Space Mountain posters for Stareophonic Sound have a very similar design! Almost identical! I thought this was an official Disneyland poster at first. Great eye-catching design. 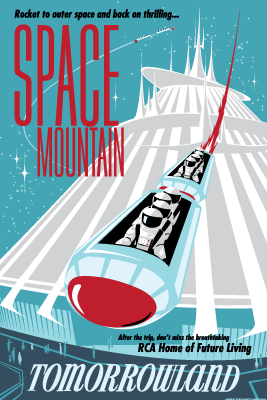 We are redecorating my son’s room with a Disneyland theme (he LOVES the parks even more than I do) and I think this Space Mountain poster will be part of it. Nice work and THANK YOU! I thought this was vintage when I first saw it! LOVE IT! I’m doing a mod space theme for my newborn’s room… this is going to be the finishing touch! Thanks so much!!! Thanks so much!!! We did a vintage Mickey nursery for our new baby and this is a perfect addition! This is so awesome! Space mountain is my favorite ride. you have incredible work. Thanks for sharing! These are amazing. Ever since returning to disneyland this spring and seeing posters like these, I’ve become obsessed! So very cool! Thank you for sharing. My kids will love this in our art space. I found this looking for images for Space Mountain. I need an example to paper piece a Space Mountain for a scrapbook page. This is the best I’ve seen. Love the poster! Great job! Excellent job on the posters, Greg! Thanks for sharing them with us! (and remembering If You Had Wings) But for the record, I LIKE the original SM poster. I even have it on a vintage 1980 mirror. My favorite ride, so I had to have it. I love the style, the look. Thank you so much. I am going to print this for my son’s bedroom. Love this. Thank you for sharing your work. This will look great in my sons room, Thank You!!! thanks for the poster, my son will love it! The futurism, the succinct visualization, everything. Thanks for the great work! This was the first roller coaster I ever went on back in 1983 and I’ve always had a soft spot for it. This is fabulous. Will hang in our space themed bedroom! Thanks so much. Great work. I have been working on a 20,000 Leagues Under the Sea attraction poster for some time and your images have given me some ideas. Thank you for the down load. We will definitely be printing these up for our home. Thank you! It will look perfect at the 60th birthday party I’m throwing for my dad (the ultimate Disneyland fan)! Love these…going in my sons room! I’ve been looking for this poster for a year, so glad I found it, stunning work! hello, how big can this be printed. i resized to a 22 x 28 and it looks fuzzy. i would love to print this for my son’s room and hang next to his vintage grand prix raceway poster. thanks! thank you! do i need to resize the pdf version as you describe above, or just go for it at 22 x 28. thanks so much. this is a gorgeous piece…did you know it is being sold on etsy. i hope you are profiting from that! Elizabeth (sorry, it won’t let me reply to your last post directly), if you want 22″x28″, I assume you are going to a Fedex Office or similar to have it printed? If so, just give them the PDF file, and they’ll know what to do with it. You shouldn’t have to resize anything. And yes I know people are selling it on Etsy! I have authorized one person to do so, but there are a lot of cheaters. thanks so much for all this info. that is a real bummer about the cheaters…ugh. i greatly appreciate your goodwill with sharing your art and your advice/help! This is such an awesome poster! Thanks for sharing, I’m so excited to turn this into a cover for my planner. This is such a gift, thank you for sharing these! Thanks for the poster! What a great job you did. Going to try and do a print with 3 d elements like the coaster cars. Will send you a shot when its done. Looking for a similar for the people mover. May have to take a crack at making it myself. Brilliant work! For those of us with tremendous imaginations but little artistic value, thank-you!! !